When The Nomad Factory got in touch wanting to know if I’d like to review one of their TNs it didn’t take me long to decide I wanted one of these beauties. The leather notebook covers looked beautifully well made. What also caught my eye was the fact that they all came with notebooks and card pocket as standard. To buy the inserts separately from another shop (particularly if you just want basic inserts) can sometimes be a little frustrating. Nomad Factory also have little kits that include extra accessories. There’s three colours currently available in the TNs – black, brown and rustic. The aged look on rustic looked fabulous, so I opted for that one. Currently these TNs are only available in regular size. If you follow me on Instagram you may have caught my unboxing of this a couple of weeks ago. I don’t think I’ve been this excited to receive a parcel in a really long time! Ed tells me this all the time, but I’m a sucker for packaging. The presentation of this box was lovely, it really made the TN feel special. The TN came in a sturdy box with paper packing materials to ensure everything arrived perfectly. There’s also a real eco friendly thinking when it comes to the packaging. Everything can be recycled or reused. Inside there were two cotton bags – one for the TN and one containing some clips I was also sent. These were a really nice touch. I like my leather notebooks to look worn and used but if you wanted to keep it perfect, this bag would be ideal. Inside the bag was the TN already made up with the inserts inside. The clips were a nice selection of all the different ones available from Nomad Factory. What first caught my eye about this is how thick the leather is. It’s thicker than that on my Midori. Despite being thick however, it’s not at all stiff. This notebook has a lovely floppiness to it whilst still feeling incredibly high quality. All the leather for The Nomad Factory comes from Yorkshire and you can tell a lot goes into sourcing great quality materials. It also smells amazing! Everything is high quality on this, even the elastic is lovely and thick with brass elements. You receive three inserts with this – graph, lined and plain. The bullet journalers among you may miss a dotted insert and I’ll be honest I did too. However, this collection of inserts will probably have a little bit of something for everyone, no matter how you choose to use it. All inserts have kraft card outers, with smooth white on the inside. The pages are more of a cream than a white and the pages are nice and thick. Each insert has 32 pages and is staple bound. The graph insert is definitely my favourite. While I prefer my lined paper a bit narrower than this, it’s still a good insert. In terms of the paper quality it seems really good so far. I’m in the middle of setting this up (follow up post coming soon!) and it’s coping with all pens without any bleed or ghosting (brush pens, fountain pens and gel are what I’ve tried so far). The kraft pocket insert is a nice touch and very handy. Like the other inserts, it’s thick and of a high quality. I really love this TN. Everything about it seems so much sturdier than my Midori. The inserts don’t seem to move around like they do in the Midori and writing in it is really enjoyable. This amount of inserts is it’s limit though and the middle notebook can sometimes jut out slightly. I think with a little training it should settle though. Dot refills are available from The Nomad Factory and given the high quality of the inserts I’ve received, I’d be more than happy to stock up on them next time I need some. The only thing this is really missing is a pen loop. If I was to purchase another one I’d definitely buy one with the pen loop included. At £40/£45 for a TN and four inserts this is exceptional value. Particularly when a Midori is generally about £40 without any inserts. Currently these are only available in regular size, but with such a great price and high quality if they were to release a B6, I’d finally take the plunge on that size. I’m really intrigued as to what further products The Nomad Factory will be releasing. There’s mention of a leather travel range coming in 2018 and I’ll be keeping a keen eye on what that is. 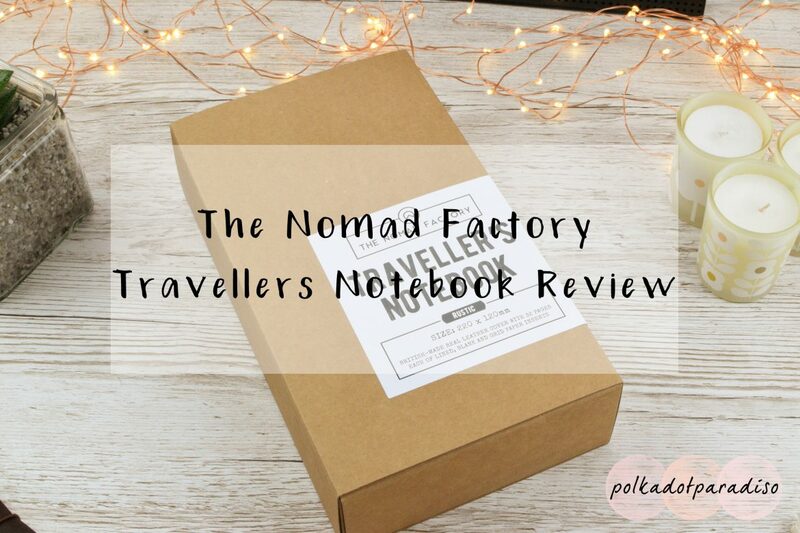 Have you had a TN from The Nomad Factory? Let me know your thoughts in the comments below!